By Sean Jones: Gennady Golovkin (38-1-1, 34 KOs) is in a position right now where there aren’t any big fights available to him for his next fight. Saul Canelo Alvarez is scheduled to face Daniel Jacobs in a unification fight on May 4, and WBO middleweight champion Demetrius Andrade is expected to face former champion Billy Joe Saunders. Golovkin is reported to have been offered a 2-fight, $45 million deal with DAZN. The first fight that Matchroom Boxing promoter Eddie Hearn is said to have been interested in Golovkin taking was a fight in the first half of 2019 against his fighter WBO middleweight champion Demetrius Andrade (27-0, 17 KOs). The second fight would be the money one against Canelo Alvarez in September. Things could get complicated if Golovkin lost to Andrade, and/or Canelo was beaten by IBF champion Jacobs. For GGG to fight Lemieux again, he would need to be with DAZN. Lemieux is with Golden Boy Promotions, whose fighters are compete on DAZN. The Canelo-GGG 3 fight is still possible for September, as long as Golovkin signs with DAZN. If he doesn’t sign with them, it could make it very difficult if not impossible for the two warriors to face each other again. GGG’s promoter Tom Loeffler said that he would be back in the first half of this year. It’s now February, and there’s still not fight announced for Golovkin. The problem that GGG has is he’s not yet signed with one of the networks. Once Golovkin makes his decision in which of the networks that he’s going to go with, then that will help determine what his options with them. If Golovkin signs with DAZN, which many boxing fans are hoping he’ll do, then he can fight Demetrius Andrade, Canelo or Danny Jacobs. Unfortunately for Golovkin, he’s waited too long, and those guys are now signed or about to sign for fights. If GGG goes with DAZN, he’s going to have to wait for one of those guys to get freed up before he can get a shot against him. That doesn’t mean Golovkin can’t fight someone in between then. His promoter can come up with someone that is suitable for him to fight on DAZN. It’s just that it probably won’t be a big name until those other guys get done with their fights. READ Rob Brant vs Murata II Set For July 12 in Japan! It’s looking like Golovkin’s best option for his next fight could be against WBA World middleweight champion Rob Brant (25-1, 17 KO). Brant, 28, is coming off of an easy 11th round knockout win over Khasan Baysangurov (17-1, 7 KOs) last Friday at the Grand Casino, in Hinckley, Minnesota. If GGG wants a quick title shot against a vulnerable champion, Brant is the way to go for him. Brant is a light puncher, who throws a lot of shots. He would be there for Golovkin to land his big punches. However, this is a fight where Golovkin would likely need to be signed with Top Rank for him to be able to fight Brant. The good news is that Golovkin could still do PPV fights if he goes with Top Rank. However, GGG vs. Brant might not bring in a lot of buys on PPV. The money fight for Golovkin is a trilogy match against Canelo in September of this year. Golovkin can potentially over $20 million for the September trilogy fight with Canelo. 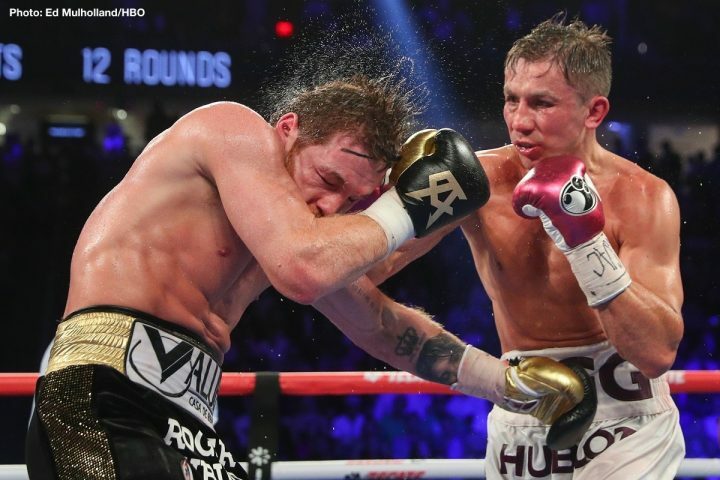 GGG likely feels like he was raked over the coals from his rematch with Canelo last September in Las Vegas, Nevada. That was a fight that many boxing fans felt could have gone GGG’s way. The judges scored the fight 115-113, 115-113 for Canelo and 114-114. There was nothing Golovkin could do about it. He let Canelo get a big head star in that fight, and that made it tough for him to rally in the second half. In hindsight, GGG should have adapted quicker, and not given ground to Canelo the way he did. It didn’t look good in the eyes of the boxing fans, and likely the judges as well, for Golovkin to be retreating from Canelo during much of the fight. Golovkin has gone quiet since his loss to Canelo last September. GGG and his promoter Tom Loeffler of K2 Promotions haven’t been giving interviews dropping hints about the direction that he’s going to go in. Golovkin hasn’t been giving interviews at all, which is unusual for him. Loeffler has openly admitted that he doesn’t know which platform Golovkin will ultimately wind up on. It would be a pity if Golovkin chose to retire from the sport at 36. He showed in his two fights that he was the better fighter than Canelo in the eyes of the boxing media, as well as with a lot of fans. For GGG to retire while he’s still on top would be a waste. It would be like how baseball great Ty Cobb after batting .323 in 1928. That was an off year for Cobb, so he retired at age 41. Cobb was a young 41. Golovkin is still fighting at super high level, as we saw in his two fights against Canelo. GGG failed to get the victories in his two matches against Canelo, but you can argue that he would have won the fight with a different set of judges and a different venue. Agreeing to fight Canelo twice in a row at the T-Mobile Arena in Las Vegas could have been Golovkin’s undoing. It’s got to be tough on Golovkin to get motivated for the lesser fights against hungry lions that haven’t achieved what he’s accomplished during his career. But as long as Golovkin’s deal with whatever network he winds up with is a guaranteed one, then it might not matter who he faces. If GGG is going to make his money anyway, then it would be up to who the network wants him to fight. If GGG signs with premier Boxing Champions, he would likely be facing interim WBC middleweight champion Jermall Charlo, and possibly his brother Jermell or Jarrett Hurd. Those are all good fighters.